Gov. 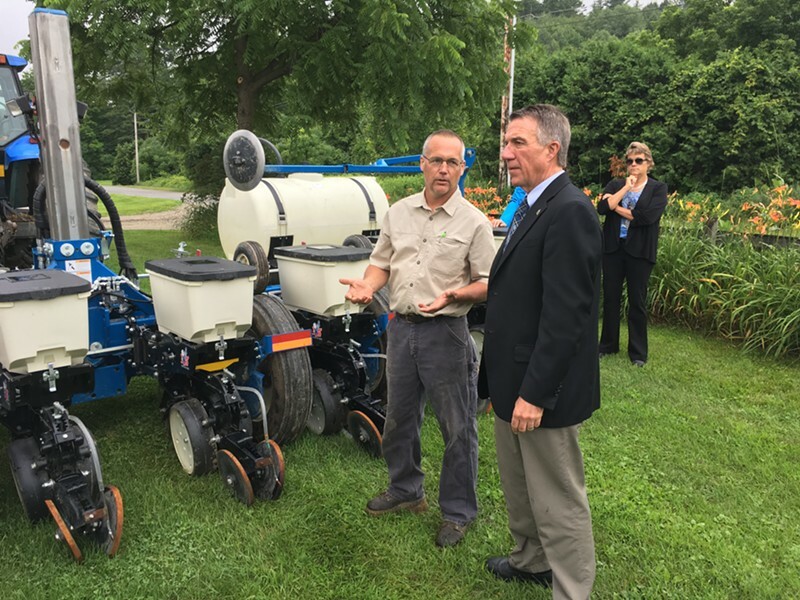 Phil Scott visited the North Williston Cattle Company Thursday to unveil a voluntary program aimed at encouraging environmental responsibility among Vermont farmers. It was, to some, an ironic choice: The farm uses sludge and biosolids from a nearby wastewater treatment plant to fertilize some of its crops — a controversial practice in the environmental community. In fact, a bill under consideration in the Vermont legislature would ban the practice. The new program is called the Vermont Environmental Stewardship Program. Farms enrolling in the program will be subject to soil testing and other measurements. If they pass the tests, they will be certified as using best-management practices to minimize their environmental impact. "Farmers in Vermont have a lot to contend with," Scott remarked. "Whether it's running the business itself, dealing with the weather, caring for animals, growing crops, and navigating all the rules and regulations that are put into place. "Many farms and farmers across the state are going above and beyond to protect the environment. They're putting in extra time and extra money to protect our soils and our rivers, and to ensure a bright future for the next generation of farmers in our beautiful state. Now we have a program that uses a science-based approach to recognize farmers who are doing more and going farther to protect our natural resources." The new program is getting a slow rollout. As many as 10 farms will be selected to take part in a pilot project over the next two years. At first, the only reward for success will be recognition; state officials say they hope to add more concrete rewards later through public-private partnerships. Scott hailed North Williston Cattle Company as one of those farms that has gone the extra mile in stewardship; it is one of five farms already enrolled in VESP. However, as owner Lorenzo Whitcomb explained, the farm has for several years been using human waste as fertilizer in fields that grow cattle feed. H.211 would phase out the use of human waste on farm fields; it will be under consideration during the 2018 session. The governor seemed only vaguely aware of the issue, and said he had not taken a position on the bill. But after the press conference, Agency of Natural Resources secretary Julie Moore hastened to offer her perspective on his behalf. "I know there are concerns about viruses and bacteria as well as personal care products," she explained. "But there's a rigorous framework in place that allows us to have confidence in the quality of these materials." One other key benefit, she added, is that the waste materials are put to use rather than being landfilled. On balance, she said, it's "a beneficial reuse." Jon Groveman, policy and water program director for the Vermont Natural Resources Council, noted that a 2016 report by the Agency of Natural Resources, published before Moore became secretary, "contradicts her position." The report reaches no firm conclusions on the wisdom of the practice, but it does point out potential hazards and cites alternative ways to dispose of sludge and biosolids. The text of H.211 quotes the report as evidence for a ban on agricultural use of human waste. "There are pathogens, metals, chemicals and toxics" in the sludge, says Groveman. "To feed it to animals producing milk and beef — it's not a good way to go." Moore insists that H.211 is "problematic. If there's an opportunity for beneficial reuse and it can be done safely and appropriately, we're all for it." Apparently it depends on your definition of safety and appropriateness. Thursday's cool, wet weather also hampered the VESP unveiling. It was designed as a photo opportunity. A demonstration of the farm's practices was on view, and there was an array of agricultural equipment set up on the lawn. The administration even offered aerial footage of the farm to TV outlets. But because of intermittent rain, officials held the press conference inside a barn, the unmistakable scent of manure and the occasional mooing of the cattle adding a multi-sensual aspect to the event.